I know it's a surprising title, especially from a dietitian, right when quitting sugar is the trendiest thing to do these days. 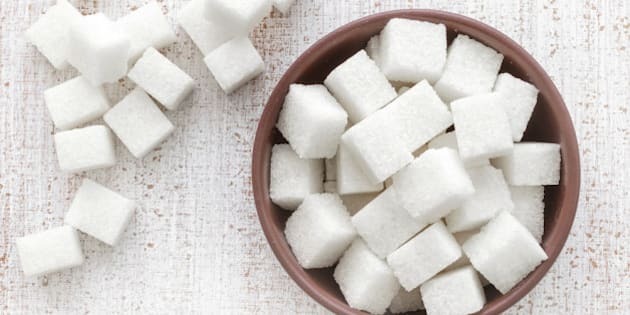 I think most people eat too much sugar -- 25 teaspoons a day is the average, which is higher than the recommended six to nine teaspoons -- so this post isn't about encouraging you to eat more. I know it's a surprising title, especially from a dietitian, right when quitting sugar is the trendiest thing to do these days. But I think I have a pretty good argument for why you should keep some of the sweet stuff around. I don't want to get angry emails about how I work for the sugar companies, because I most certainly do NOT. And let's get this straight right now -- I think most people eat too much sugar -- 25 teaspoons a day is the average, which is higher than the recommended six to nine teaspoons -- so this post isn't about encouraging you to eat more. It's about being realistic, and it's about not throwing away common sense with the sugar in your diet. You can (and probably should) cut down the amount of sugar you eat, without cutting it out. Why would a dietitian tell you not to quit sugar? Some people are successful in quitting sugar for extended periods of time, just like some people are successful in not eating any bread or chips or Diet Coke for long periods of time. Works for some, but not for many. Are you never going to eat sugar forever and ever? Come on, get real. Hello, birthday cake? If you're trying to cut out sugar for a finite period of time, like 10 days or two weeks, what are you expecting to gain? My point is well illustrated by a tweet I saw this morning from someone who is quitting sugar for 10 days. It had a picture of cookies and a comment about how badly the person wanted one. Another person had responded by saying, "be strong! The cookies will be waiting for you on day 11!" What. The. Hell. Then why "quit sugar" at all? If depriving yourself is only going to make you crave sugar, don't do it. If you're just going to go back to eating a ton of crap after your #detox is over, why are you punishing yourself? Seriously people, what happens after those 10 days? Do you do a swan dive into a pile of macarons? Step away from the extreme, please. According to some, after 10 days your sugar addiction will be broken, but you also have to quit gluten and dairy to achieve that. Wait, what? More deprivation? How about this: you can wean your sugar way down without going cold turkey. Cut down incrementally, in barely-perceptible ways. Taking one less sugar in your coffee or swapping out your afternoon Starbucks cookie for a piece of fruit with almond butter is a better plan and so much more sustainable. And leave gluten and dairy out of this. What did they do to deserve all the hate? You don't have to quit something altogether to improve your health. Are you going to be that much healthier if you never eat sugar versus if you cut your sugar intake way down but still can enjoy sweets sometimes? I think you know the answer to this question. Not depriving yourself altogether of a single nutrient can help your diet be more balanced and enjoyable. You won't have to feel a sense of dread anytime you want an ice cream cone or when you're out with friends; you can eat like a normal person and not try to find the lowest-sugar item on the menu which you probably don't feel like eating anyways. Trying to avoid sugar in all situations can be more stressful than you imagine. Not worth it. Cutting out sugar in an extreme way is not something you want your kids watching you do. Just like you don't want to diet in front of your kids, teaching them that sugar is "toxic" is a scare tactic that isn't healthy for them. Teach your kids that some sugar is okay -- SOME sugar, not a lot -- and teach them to love the flavour of whole foods that are naturally lower in sugar. You do this not by going on a crazy sugar detox, but taking all nutrients in stride and teaching them that there are no bad, or "toxic" foods. Oh, and buying less ultra-processed crap for them helps, too. Once and for all, let's stop vilifying a single ingredient and treating it like it's responsible for our crappy diets and poor health. We all know that excessive sugar in our diets can have adverse health effects; there's lots of credible research to that effect. But focusing solely on sugar and not on your overall diet pattern can be a huge mistake, because a lot of unhealthy foods that you may be eating actually contain no sugar, and plenty of healthy foods do. I can give you some good advice to help your overall dietary pattern, and it is: eat more whole foods, and less ultra-processed foods. There. Wasn't that easy? It might not make you popular with your office mates who are doing the #sugarcleanse/#sugardetox/whatever, but that's good advice. Fad diets, cleanses, detoxes -- sugar or other -- will not make you live longer, and in many cases, will not make you any happier. Depriving yourself can be miserable and it can lead to overeating later on. I can't stand the term "moderation" so I won't use it. Instead, I will preach sustainability in diet, pleasure in food and eating, and common sense. Lots of common sense.